How can we have a world that is inhabited only by zombies and yet continues to be populated? For the purposes of this question, I envisage the type of zombie that has been infected by a virus, is clinically dead, yet still able to move around, is compelled to seek out non-infected living people, and is gradually rotting away. Notes: If the head is completely separated from the body then they are no longer active. They require at least some remnant of muscle tissue to move around. Once all the flesh has rotted off they are simply inanimate skeletons. Zombies can be considered to retain a degree of intelligence (perhaps half their original IQ) but are driven by a lust for fresh human flesh even though there is no longer any available. How can I explain a planet completely populated by the above type of zombie for thousands of years where all normal people died out long ago. (There are no pockets of 'normals' anywhere on the planet whether in captivity or otherwise). There is no magic in this world. Zombies don't breed thus their number can't increase. They don't heal because they are dead and finally, even if they don't rot, a body won't last for thousands of years. Simply moving around, the body will wear out. The only way I could see this working is through a self repair, self replicating nanobot gone bad. It spreads and replicates from a bite and keeps repairing the body but breaks the mind whilst doing so. Without some sort of regen, a body won't last for thousands of years. People don't become zombies instantly. They die, are buried and rise a week later. The funeral parlours also have a practice of embalming everyone. The only way I can think of to keep a population of dead-but-not-really-dead reproducing is to modify the life cycle of the zombie infection. 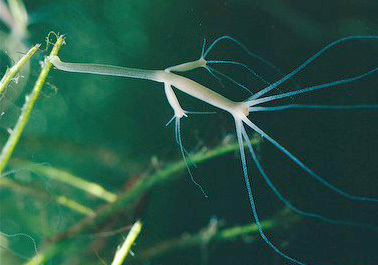 When heads or other limbs drop off, the infection enters a regenerative mode: a photosynthetic "rot" spreads over the surface, and rhizomes drive into the surface to pull in nutrients from the soil. Surprisingly, in this stage, the zombie infection shows some very useful traits. It has preserved some of the least differentiated human cells and induces them to become blastocysts. What digs its way out of the grave maybe a year (maybe a few years) later is something partly-zombie/partly-living, but never human. The virus stops helping, but does not become fully parasitic until maturity, at which point "budding" by parts rotting off happens again. The zombies themselves alone will perish over time, the only way is to keep producing new zombies, Create a machine able to create clones really fast on a regular basis, but the machine somehow ended infected by the virus, so all the clones that are born in the final process became zombies, you can even keep some non infected ones to be zombie food. The virus does not kill the people fast, it would control the chemistry of the brain, keeping the body alive, first it would make the infected seek reproduction, the first stage would be the mindles desire to reproduce, the second and final would be death after reproduction for the males and for the females after labor, the new born zombies would be a new species a altered human that live with a parasitic virus, the new specie will grow at faster rate, and when arrive a the reproduction stage, they copulate and die, becoming living corpses. I can only see this working in a world that looks like the one depicted in I Am Legend (referring strictly to the movie, haven't read the book yet). The "zombies" shown in this story are actually modified human beings. They are harmed by sunlight and their bodies are not rotting, but their psychological profile fits your description (lower IQ's). IMO, If you take out the rotting from the equation, reproduction gets a bit more feasible. In your place, I'd say that there are two kinds of zombies. The first kind are the ones who look just like the ones from I Am Legend, the "alive" ones. They turned because they got infected by the virus (airborne) or because they got bit, but in a minor way (a little chew to the arm, something almost irrelevant, that poses no threat of death). These zombies are still living beings, still have some IQ (not enough to speak, but enough to live in groups probably) and they can reproduce - but hunting humans for food is what drives them. This will be a temporary phase of the zombie virus in the human body. The second type of zombie is the actual walking dead. After some time (up for you to decide) the I Am Legend ones "die" and become these. Their bodies start to rot and they turn into... zombies. They can also be born when someone dies in a gruesome way (like being the lunch of a few other zombies). The remains of what used to be that person won't become an I Am Legend, he'll become a zombie straight away. This will be the ultimate stage of the zombie virus. If they cannot reproduce, they will mathematically go extinct. It might take a while but since they naturally decay and become skeleton they will eventually all die. Not the answer you're looking for? Browse other questions tagged science-based survival population zombies reproduction or ask your own question. How would a completely urbanized city-planet support its population? How can zombies be explained without using magic? Where can zombies get the energy required to keep moving?